STUDIOFILMCLUB is located in the back studio of building 7. The events surrounding the making of "It's All True" aren't mysterious but, like so many chapters in Welles's professional life, they are full of production complications, financial problems and the interference of money men who never see themselves as made of money. Conspiring in the disaster was Welles's own tendency to be high of hand, loving of fun and casual about schedules set by others. The initial conception of "It's All True": Welles was already planning an anthology film in 1941 when he was approached by Nelson Rockefeller, who was a large stockholder in RKO Pictures (Welles's studio) and the coordinator of the Office of Inter-American Affairs. Rockefeller's idea was for Welles to make an entertainment film to help promote President Franklin D. Roosevelt's Good Neighbor Policy. Up until 1942 it was not certain that the Brazilians would not align with Germany because of their presidents flirtations with fascism. This changed when the Germans torpedoed five Brazilian ships - and when Brazil and America signed a military accord. It was a busy time for Welles. He was finishing work on "The Magnificent Ambersons" and acting in "Journey Into Fear," which he had supervised though it was being directed by Norman Foster. By chance he had earlier envisioned a short film about a Mexican boy and his bull, "My Friend Bonito," which was to be one of the three segments in the RKO-produced, Government-promoted movie celebrating Latin America. He decided that the second segment would center on the annual carnival in Rio de Janeiro, and that the third would be determined when he arrived in Rio. In those youthful days, Welles was full of energy and magnificent self-assurance. Yet "It's All True" seems never to have been thought through with any realistic sense of time, place and money. He oversaw the shooting of several sequences of "My Friend Bonito" in Mexico and then, in February 1942, took off for Rio with both Technicolor and black-and-white cameras to photograph the carnival. That did not go easily, but he did get the idea to use the story of the history of the samba as one of the principal themes of what became the two Brazilian segments. Welles spent close to six months and a great deal of money improvising his way through the film. He delved into the samba world for the episode Carnival in Rio and reportedly spared no expense in his quest for the authentic. Sambista Raul Marques (1913–1991) told how, during the filming of a batucada, the pernada tripping contest turned violent, but the director egged the contestants on and continued shooting until the bitter end. Several participants were injured, and the actor-singer-songwriter Grande Otelo was hospitalized. When people complained of the violence, Welles said, “I’ll pay for everything.”The second segment was to be a re-enactment of the story of four Brazilian fishermen from the northeast who, the year before, had caused a sensation when they sailed their tiny fishing raft across 1,600 miles of open ocean to Rio to seek redress for social ills. RKO officials quickly panicked about the money Welles was spending in Rio without having a finished script. The carnival material they saw was formless. But they truly hit the ceiling when Welles's interest turned to Rio's favelas (mountainside slums) and blacks in his search for the samba's roots. Poor people, particularly poor black people, did not fit into any good neighbor policy that RKO or the United States State Department wanted to publicize. The production was halted in midstream by RKO, but Welles persisted in his efforts to finish the film's third segment, "Four Men on a Raft," with a modest budget and primitive equipment. This material, which he shot but never edited, changed hands several times and then was lost. Some of it was destroyed. 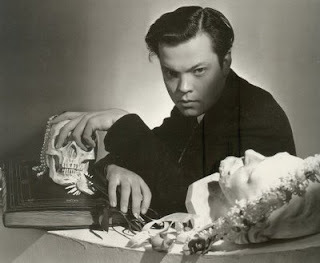 In 1985, the year Welles died, the surviving material was found in a Paramount vault. Because there was no screenplay, Richard Wilson, Welles's assistant in Brazil, used letters and memorandums to put together a 22-minute version of "Four Men on a Raft," which was shown at the 1986 Venice Film Festival. That material remains the heart of the new documentary. The new film also makes use of the remaining Technicolor carnival material and several sequences from "My Friend Bonito," all supplemented by filmed interviews with Welles, both as a young man and in later years; with Wilson, who died of cancer in 1991; with other associates, and with some of the Brazilian members of the project who are still alive. It's the black-and-white material from "Four Men on a Raft" and "My Friend Bonito" that gives the documentary its importance. There is the initial surprise at the way it recalls the look and style of the great Russian film maker Sergei Eisenstein in his monumental "Que Viva Mexico!" (1930-31), a project almost as cursed as "It's All True." Planned as four distinct stories, with a prologue and an epilogue, "Que Viva Mexico!" was taken away from Eisenstein by his American partners before he could put it together. It was later edited into four separate films that could only hazily suggest what Eisenstein would have done. Yet the Eisenstein material was preserved and, if not honored, it was at least used. Welles's material was casually trashed. Both "Four Men on a Raft" and "My Friend Bonito" have the gloriously liquid look of the heavily filtered, black-and-white photography favored in the 1930's to ennoble peasants and other common folk. It's corny and possibly condescending, but it still works. Glauber Rocha, a leading talent in Brazil's own Cinema Novo movement, used the same style in his "Barravento" (1961), which is set in the fishing villages of Bahia. Of special interest is the funeral procession sequence in "Four Men on a Raft," a stunning preview of the even more remarkable sequence that would later open Welles's "Othello." "It's All True: Based on an Unfinished Film by Orson Welles" might have been even more fascinating if Welles's raw material hadn't been so smoothly edited that it's impossible to tell how sequences were put together, what was saved and what was discarded. Such a film would be unwieldy, if of more scholarly interest. Though Welles's own "It's All True" remained unfinished, its place in history is firm: if Welles had not undertaken the project, the chances are that his greatest film, "The Magnificent Ambersons," would not have been butchered by the studio while he was flying down in Rio.